Insecure dogs, or shy/timid dogs may need a little more patience and understanding. What a good feeling it is, though, when you finally win their trust. You get to see what wonderful dogs they can be with a loving family and a little training. Insecure dogs tend to be extremely submissive and lacking in self confidence. They bond closely with their owners and requires more human attention than most. Dogs with this personality type need owners who are calm, consistent and patient, being sensitive to the dogs needs and feelings. These dogs don’t like being in uncomfortable situations, or around lots of activity or loud noises. Yelling or harsh discipline can cause them to shut down, and you risk losing their trust. Insecure dogs may be quick to show teeth, snap or lash out in situations where they feel threatened. Insecure dogs, also, do not handle being left alone well. They tend to suffer from separation anxiety that results in howling, whining, or destructive behavior. The insecure dog will do best in a predictable and structured lifestyle. A consistent schedule works best for them. Dogs with and insecure personality type are rarely compatible with aggressive type dogs. They might react violently if placed in a situation where they feel there is danger to their safety, making the aggressive personality type dog also react violently. Compatible with both confident and outgoing dogs, while supervised. Because supervision is needed to prevent bullying from the confident dog. It’s also needed to prevent over-exuberant socialization from the outgoing dog, which could be perceived as a threat from the insecure dog. Independent and adaptable dogs are also highly compatible with the insecure dogs, with little chance for conflict. Adaptable dogs will lean towards submission with insecure dogs. And independent dogs will mostly ignore an insecure dog. 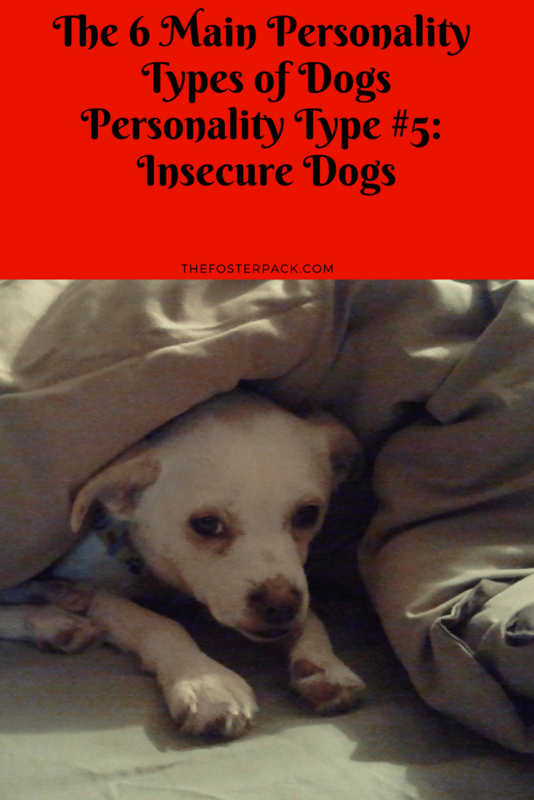 One of my former fosters was a very insecure dog. Probably the most insecure dog that I had ever met. Passed over time and again, and with us for months before the perfect family was found for her. She is now wonderfully adjusted, and quite social. She just needed the right family, and training. If you have an Insecure dog, learn more about Working with an Insecure Dog.